All objects can be looked at in our online shop. To be able to judge the relative sizes, a match or a box of matches is added for comparison. Besides, you can magnify the illustrations through mouseclick. 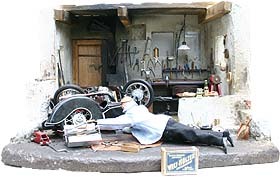 Each of the workshops is fitted by Mr. Zanella personally, making it a small piece of art and an unique specimen as well. The individual tools as well as the complete workshops are laboriously made by hand, and are fully functional. 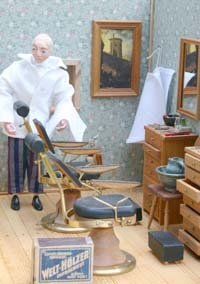 The miniatures correspond to a scale of 1:9 and are styled according to the period of 1900 A.C. 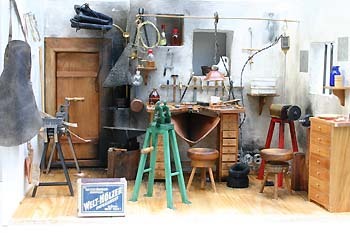 Some tools and items are additionally available in the scale of 1:12. 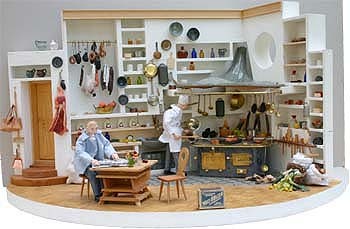 The workshop of the carpenter, that of the bricklayer as well as that of the timber worker, are also available in the scale of 1:5. You can just as well acquire individual parts and arrange these as you like it. When Franz Zanella meant to manufacture a toy shop for his granddaughter, he was not satisfied with the quality of commonly offered miniatures. So he made the fittings himself. 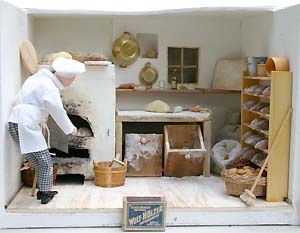 Doing this gave him so much pleasure, that meanwhile 25 different workshops are handcrafted in his family concern, like toy-shops, kitchens, dentists`- and doctors`practices, with all the items belonging to them.